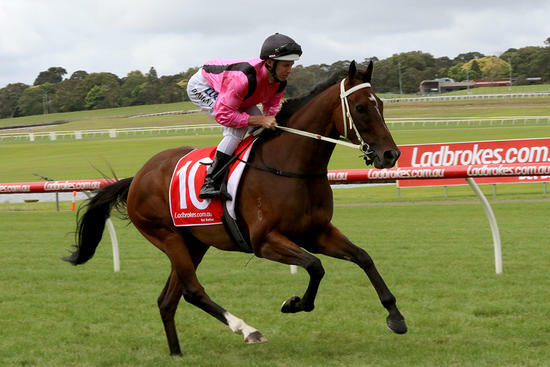 The Cameron Racing silks told the tale after The Thug’s metropolitan success at Mornington on Wednesday. Damian Lane returned without a single mud splatter after making all the running on The Thug (pictured) to win the Norm Cove Handicap over 2000m. Lane fired across and then set a steady speed in the lead aboard The Thug who stayed on strongly to defeat Eureka Street by 1 1/4-lengths and give the stable another metropolitan winner. Lane said The Thug settled into a beautiful rhythm for him during the race. “He did a great job under the circumstances,” Lane said. “He had to make all and we had to do a little bit in the lead. “I was a little bit concerned around the first bend because I fired him up to get across but he came back underneath me and settled into a beautiful rhythm. “The horse did the rest and he gave me a good kick off the final turn.